If you haven't heard about the dangers of combining vaccinations and flea treatments, this tip from pet expert Wendy Nan Rees could save your dog's life. Learn how she uses blood titers to check her dogs' immunity levels and space out their boosters. I came home the other day to the message that my friend's dog had passed away at the vet's office. I just about fell over! She was a healthy, four-year-old female Labradoodle. I was shocked when they told me what happened. My friend took a trip home to Puerto Rico and didn't want to take her dog with her since she was only going for a week. She decided to board her dog at the vet's office for eight days while she went home. How did my friend's dog die at her vet's office? They gave the dog all of her regular vaccinations, after which they gave her a special flea and tick vaccine, and then they bathed her. It was just too much for her system to handle. She went into what is called IMHA or Immune Mediated Hemolytic Anemia. IMHA is a red blood cell disease with a double whammy. First of all, the body is not regenerating any new red blood cells at the bone marrow level, so eventually the body becomes anemic as the glands and organs become oxygen starved. Second, the body's immune system has gone bonkers. It thinks the remaining healthy red blood cells are bad and starts to destroy them as foreign invaders. So, while vaccines are beneficial to boost immunity to certain viruses, the process of vaccination is very traumatic to the body. Immediately after the vaccination, the body's immune system will be depressed while the body naturally starts to recover from the shock of the vaccination process. If the vet gives too many vaccines at once or administers a vaccine to a body whose immune system is already compromised, the dog could have problems. Vaccinosis is a term used to describe any adverse effects from vaccinations; this can include everything from allergies to fever, tumors. cancer or anything else that results from a compromised immune system after vaccination. For instance, if your dog has a chronic disease or for any reason is not completely healthy, it should not be vaccinated. If it is, the dog could develop more serious problems. All vaccines carry a label that states "For use in healthy animals only." Many jurisdictions will accept an exemption letter from your veterinarian attesting to the fact that your pet is at high risk for vaccination complications if it is sick or being treated for a disease and so cannot be vaccinated. I always request a blood titer first to check my dogs' current immunity levels because maybe we do not even need any vaccinations. Should we indeed need something, then we will get it done. This is how my ex-husband and I have always handled the situation. I will not allow more than one vaccine at a time, and no two vaccinations within a three to four week period. 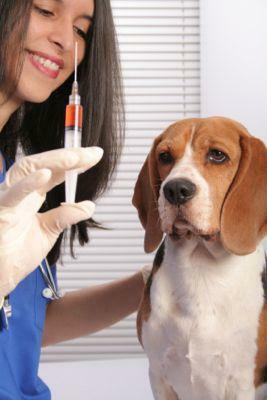 I never vaccinate my pets if they are sick or currently receiving veterinary treatment. If my pet had a chronic health condition, I would always consult with my holistic vet to see which additional risks might be involved in vaccinating my pet. I would also investigate if there were any alternatives, such as titer testing and getting an exemption letter from your vet to show your local authorities why you are not vaccinating your dog at that time. If you take nothing else away from this tip, please do take this: it is up to you and no one else to be your dog's guardian. You need to do what you believe is correct no matter what. It's alright to tell your vet that you don't want your dog to have his boosters and flea treatment all at once, and there's nothing wrong with requesting a blood titer to check whether your dog needs a booster at all. A little extra caution just might prevent a tragedy like the one my friend went through.